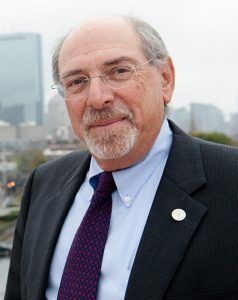 Barry Bluestone, a professor of political economy at Northeastern’s School of Public Policy and Urban Affairs who served as the school’s founding dean from 2006 to 2012, participated in the January 31 installment of the series, which focused on “Challenges Posed by Economic Inequality & Stagnation” and also featured progressive journalist Robert Kuttner. On Monday, Northeastern’s School of Public Policy and Urban Affairs posted a video of the two-hour event to its YouTube page, near the end of which Bluestone shared his fantasy of seeing Donald Trump leave the presidency, either through impeachment or death. Bluestone pointed to the camera and then to Kuttner saying “FBI,” as if to suggest that any FBI agents listening should heed Kuttner’s hasty correction.